Some more of the legends that develop around tomb carvings. Most of these are from Twitter. We have now put out an appeal for more – watch this space! It’s a fascinating subject and there must be a book in it somewhere. We looked at some examples at https://churchmonumentssociety.org/2018/07/24/stories-from-stones but there are clearly lots more out there. 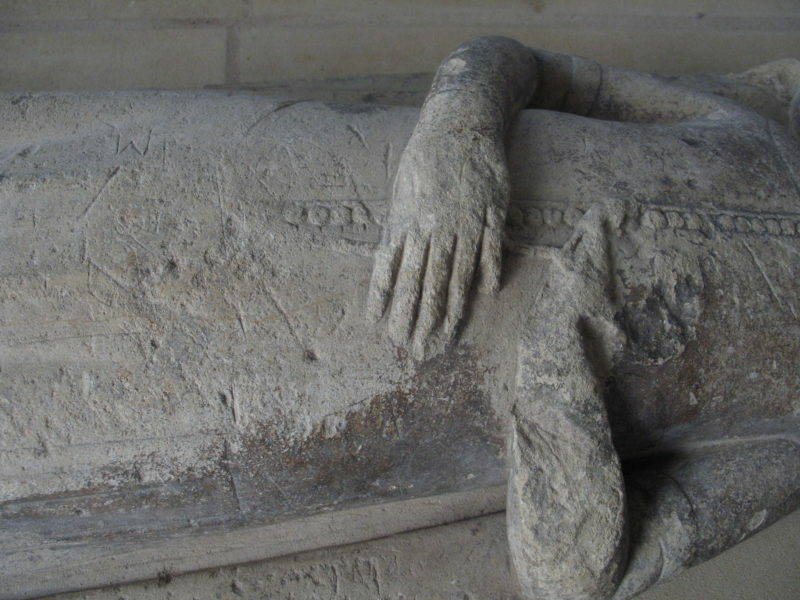 @bwthornton tweeted for #FolkloreThursday ‘It is said that the praying hands of Lady Wilcote of North Leigh are slowly parting and when they finally separate she will rise and haunt the village. Workmen found treasure concealed in the tomb, but returned the gold when a dark shadow dogged their steps.’ The photo at https://twitter.com/bwthornton/status/1055392607147298817 shows her hands still quite close together, so we may have to wait a while. At Abergavenny, the effigy of a young woman from the great Hastings family looks as though she was once holding something in her hands. A chain from her hand to her pocket suggests a pet (Churchyard in 1587 and Archdeacon Coxe in 1800 described it as a squirrel). The local legend was that her pet squirrel escaped and ran up a tree, she climbed after it and fell to her death. Tombs could also acquire reputations for healing. @AncientTorfaen reminded me about the Colmer incised slab at Christchurch near Newport in south Wales. This is now so badly worn as to be indecipherable, but this is John Rodger’s drawing of it in the Transactions of the Cardiff Naturalists for 1911. Rodger’s reading (based on John Strange, ‘An account of some Remains of Roman and Other Antiquities in Monmouthshire’, Archaeologia V, 1775, pp. 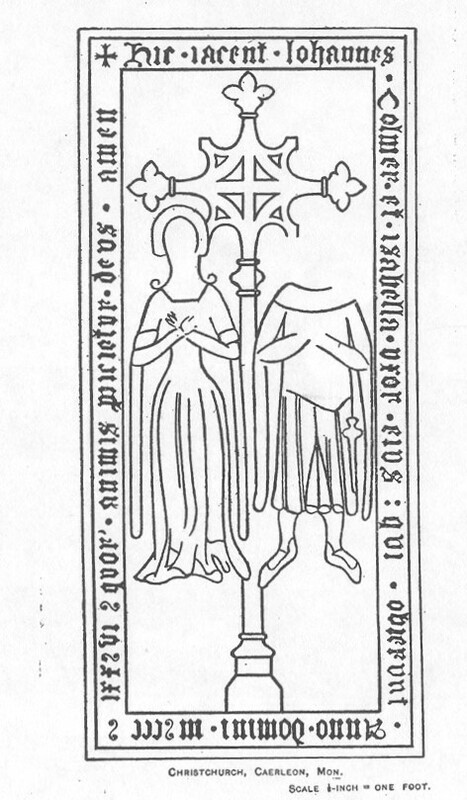 78-9 and plate 3) is: ‘+ Hic iacent Johannes/Colmer et Isabella uxor eius qui obierunt /Anno domini M CCC /LXX VI quor’ animis p’picietur deus amen’ – ‘Here lie John colmer and Isabella his wife, who died in the year of our Lord 1376, on whose souls may God have mercy’. In the same article, Strange recorded the local custom of laying sick children on the slab on the eve of Ascension Day. 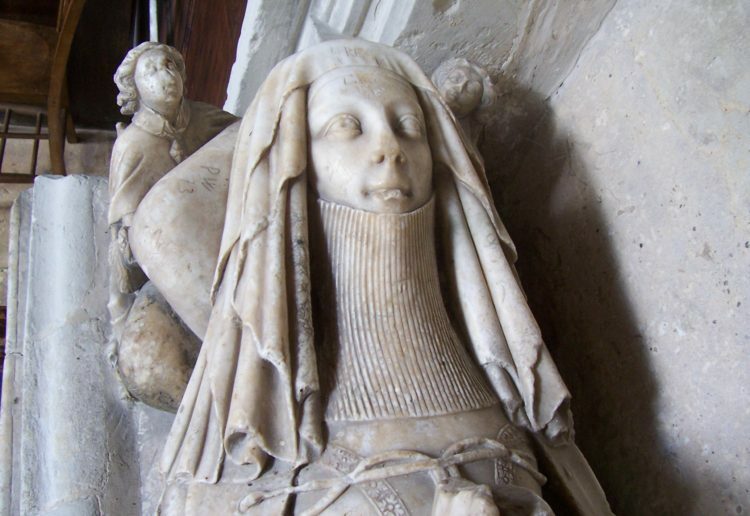 And @sueweldonbooth recalled that chips of alabaster were taken from the effigy tomb of Gronw ap Tudur and his wife (ancestors of the Tudor dynasty) in Penmynydd church and boiled to make a curative paste for eye infections.